Amphibians Produce little heat and lose heat rapidly by evaporative cooling. Behavioural adaptations. - Seek cooler or warmer microenvironments. Mucus (regulate evaporative cooling). Reptiles Regulation rather than maximisation. Ectotherms that warm themselves by behavioural adaptations. In winter, bask in the sun or on warm rocks. In summer, many animals borrow or move to damp areas. A few are endotherms for brief periods e.g female pythons. Fishes Generically ectothermic but some endothermic. - Metabolic heat produced by the swimming muscles lost to surrounding water. Endothermic fish have adaptations to reduce heat loss. - Enhances activity by keeping swimming muscles several degrees warmer. Invertebrates Aquatice invertebrates are thermoconformers. 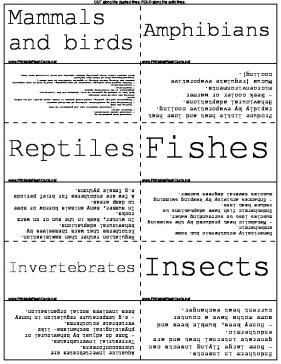 Terrestrial invertebrates. - Some do adjust by behavioural or physiological mechanisms- like vertebrate ectotherms. - e.g temperature regulation in honey bees involves social organisation. Insects Endotherm in insects. - Some large flying insects can generate internal heat and are endothermic. - Honey bees, bumble bees and some moths have a counter current heat exchanger.